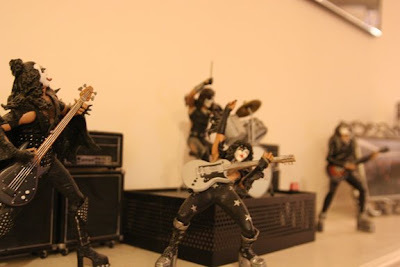 Peeks around 16 is the KISS dolls ... oops, I mean action figures. Shawn was a huge KISS fan when he was a kid and I admit, I was too. HUGE fans. I've dressed up like Paul Stanley more times than I can remember, once as an adult for a Halloween party. Shawn too. His mom took him to see KISS at the Capital Center in 1977, my dad took me and my brother to the same show. God knows how horrified they were. We still get sucked into watching KISS concerts on VH1 but mostly for the comedic value, fully laughing at ourselves in the process. Shawn collects action figures so these were a xmas present from me about 8 or 9 years ago. But I insisted that he open and display them. Most of his action figures are still sealed in the original box. 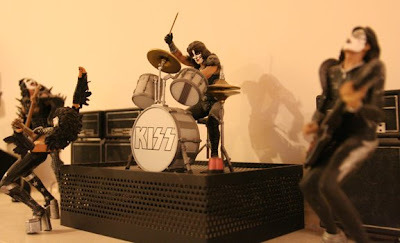 But, seriously, these needed to be displayed in the full glory of KISS Alive 1. I was at the Cap Center show in 1977 and it was the most rockin' concert ever! And I dressed up as Paul Stanley with a star on my eye a few times myself! I went sans parents though so it might a been a completely different experience for me! That is too funny Leslie! I had no idea!! I was 13 when that show came to town. Shawn was 11. My brothers and I would dress up like KISS and have concerts in the bedroom. I know our parents thought we were crazy!